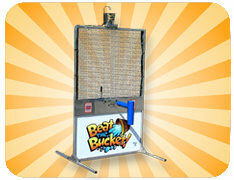 Beat the Bucket is a great alternative to a dunk tank! As one volunteer stands behind they unit, they swing an arm to try to stop the balls being thrown and two targets. The unit is completly automated! Once the target is hit, the bucket dunks water on the person standing behind the unit. The bucket then automatically resets, refills and then lights a signal light that the unit is ready to dunk the next person! Water from a regular outdoor faucet must be connect during the use of Beat the Bucket. No electricity is needed, the unit is battery operated and the batterys are included with your rental. Only the supplied soft balls that are provided are allowed to be used on Beat the Bucket as harder balls would destroy the electronics built into the unit.